I'm broadening my horizons. At least when it comes to my research into the death of Burr Zelah Dornon. I've turned my research eye to Burr's children. Where did each of them live? Where did they die and what, if anything, did their obituaries say about the passing of their parents? Perhaps they hold clues to the mystery of Burr's death and burial. Unfortunately, the results haven't turned up many answers yet. However, my broadened research has turned up another question. I've had luck tracing the steps of Burr and Sophronia Dornon's children except one. What happened to their youngest child - a daughter named Lucinda? She was born in August 1854 in Ohio. Sometime after her father dies, presumably in the early 1860s, Lucinda joins her siblings and mother Sophronia in a move to Kansas. On March 10, 1870, the 16-year-old Lucinda marries 32 year-old Sylvester Scannel in Wyandott, Kansas. A license and certificate of marriage are both issued on this day. By the 1880 U.S. Federal Census, Sylvester and Lucinda are making their home as a farm couple in Rooks County, Kansas. Their happy home, though, is upset by a tragic prairie fire that rages across the county. It destroys hundreds of acres of farmland and engulfs dozens of structures. Sylvester worked to slow the fire's spread by digging trenches. The inferno quickly surrounded him. He tried to make his escape on horseback, but was overwhelmed by the smoke. Falling from his horse, the fire was so intense that Sylvester's "clothing, except his boots and gloves, was burned entirely off his body." He died from his burns the following day and Lucinda was a widow. Lucinda's whereabouts can be traced for a short while thanks to her husband's Civil War pension. She submits paperwork confirming that she's his widow and is awarded the pension. 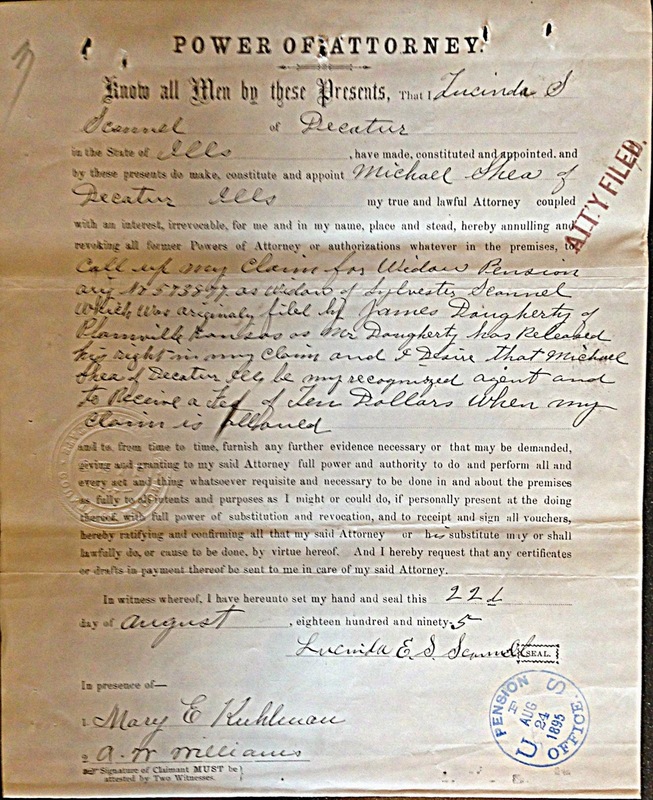 In August 1895, she completes a new Power of Attorney, relieving her attorney in Plainville, Kansas and appointing a new one in Decatur, Illinois. 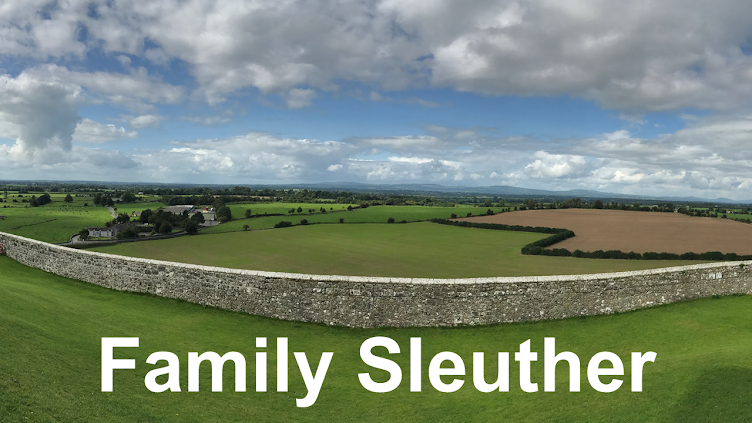 I assumed that I had been unable to trace Lucinda after the death of Sylvester Scannel because she remarried and was buried under a new surname. I figured this second marriage would come to light in my review of the Civil War widow's pension file at the National Archives in Washington, DC. I quickly realized it would be more challenging to track her down. 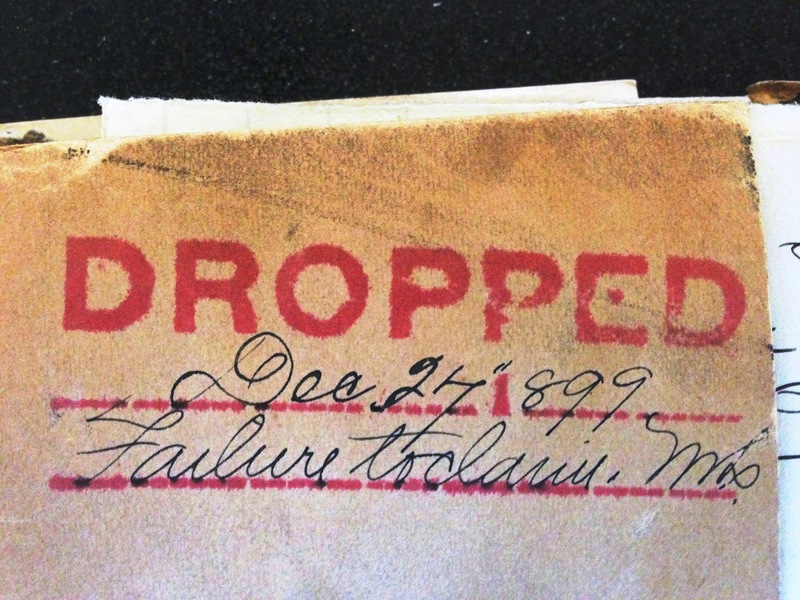 Inside her file, the first document was stamped in red letters, "DROPPED." But it wasn't because she was deceased. At least I don't think so. Elsewhere in the file, it clarifies that she was dropped from the pension rolls in December 1899 for failure to claim her money for three years. Who doesn't claim their money?! Perhaps someone who has remarried and recognizes that she no longer qualifies for the pension? A broad records search turned up a Lucinda Scannel listed as a cook in an 1899 Butte, Montana city directory. A search of Plainville, Kansas newspapers suggests this was her. She appears in the paper four times beginning in September 1894 when she returns to Plainville after an "extended visit in Illinois." The society pages of the Plainville Gazette boast a potentially juicy piece of information. 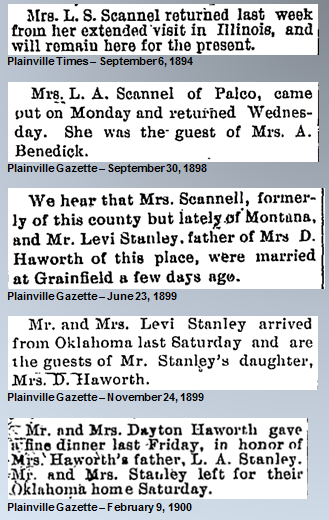 In June 1899, we find that "Mrs. Scannell, formerly of this county but lately of Montana" married Levi Stanley in Grainfield, Kansas. Aha! So she did live in Montana and she did remarry! February 1900 is the last appearance of Lucinda that I've been able to locate. Apparently she's now living with Levi in Oklahoma. Did she die there? Is she buried there? I don't know. The December 1910 obituary of Lucinda's sister Abigail (Dornon) Benedick states that she is survived by one brother and one sister. I know that both Anna (Dornon) Benedick and Andrew Dornon are still alive and I presume they are the two Dornon siblings referenced. If that's true, it would mean that Lucinda Dornon Scannel Stanley dies between February 1900 and December 1910. When did she die? Where is she buried? Clearly, she's taken a page from her father Burr's book - like father like daughter. Lucky me! I should add that I've confirmed Lucinda married Levi Stanley in Gove County, Kansas on June 11, 1899 and I found them in the 1900 U.S. Federal Census. They're living in Woods County, Oklahoma. Lucinda's passing remains a mystery.